One of the main characteristics of Peru is its people’s fervor, which they demonstrate through festivities that transmit the inhabitants’ feelings, and a special aura that surrounds those who participate in them. 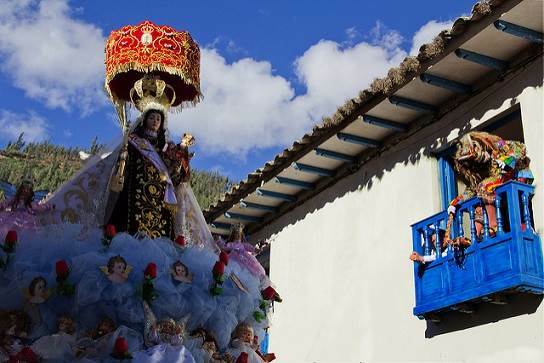 Each month of July the province of Paucartambo, in the Cuzco region, puts on its best to celebrate the Virgen del Carmen or Carmelo festivities; patron saint of the Ejército de los Andes (Andean Army), lead by the Argentinean liberator Don José de San Martín in the independence war against the Spanish crown. This worship has its origins the apparition the Virgin made in the XIII century, during Pentecost, to a group of followers in Mount Carmel, in today’s Israel. According to catholic tradition, the Virgin’s promise was to take directly to heaven those who carried the scapular with her image at all times. This is why in all her paintings and sculptures, she appears with said object on the neck. 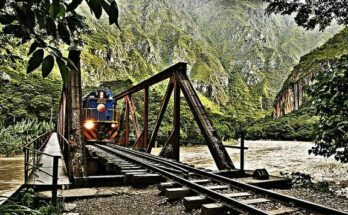 The province of Paucartambo is located at approximately 14,000 feet above sea level, and about 62 miles from the city of Cuzco. The festivities of the Virgen del Carmen take place between July 7 and 18 in the village of the same name. The main day of it is July 16. The previous night (July 15) the “qonoy” or bonfire is held. Then, the “chunchos” – dancers wearing masks shaped with the face of malicious looking animals – recreate the purgatory with wicked movements and some acrobatics. Around ten, the musicians play the “Serenata a la Virgen” (the serenade to the Virgin). It is composed of various joyful melodies, among which is the “Punchaynikipi” (”in your day”), which lasts until July 16’s dawn. At 5 in the morning of that day the “Misa de Aurora” (Aurora’s Mass) takes place to bless the festivity, and around 10 in the morning the “Misa de Fiesta” (Festivity Mass) is performed, with moving melodies that make way to the parade on the streets and squares of the province. The day ends the festivities with a large procession that begins at 3 in the afternoon and lasts until the first few hours of the night. On the 17th, known as the “bendicion y guerrilla” (blessing and guerrilla), another mass is performed. Thereafter, there is a pilgrimage parade to go to the cemetery and visit the tombs of deceased dancers. The celebrations end on the 18th, when the Virgin is placed on the temple’s altar and the villagers receive her blessing. To be a part of this beautiful celebration, we can hire the services of travel agencies such as InfoHub, which organizes two-day trips (which can be extended), in order to better enjoy the whole itinerary of the main dates (July 15 and 16). 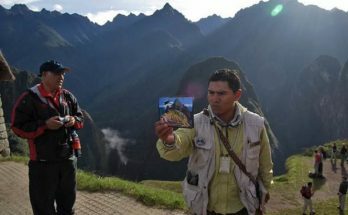 These also include the purchase of air fare (plane tickets from Lima to Cuzco), pick-up at the airport, round trip transportation to Paucartambo, a guide’s explanation, lodging at the chosen hotel and food. One of the places to stay in the city of Cuzco is the Hotel Monasterio (136 Palacio Street, Plazoleta Nazarenas), ten minutes from the airport and two blocks from the Plaza de Armas (Main Square). 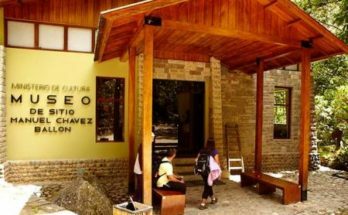 The premises – built in the old San Antonio Abad Seminary and with a five-star rating – offers its guests fax, internet, living room with fire place, safe deposit box services, as well as bar and restaurants in the hotel’s square. At the Tupay restaurant, of the Hotel Monasterio, we can sample the most delicious dishes, typical of the Cuzco area. Among those are the Adobo de Cerdo (pig stew), the Tamal, made from dried corn, the Saralawa (fresh corn soup, beans and yellow chili), the Chuño Cola (soup made with meat and rice, chickpeas and chuño) and the Pachamanca, which is always offered. To maximize the enjoyment of the Virgen del Carmen festivities, we cannot forget to bring a camera, some cash to buy drinks during the tour, as well as sun glasses, sun block, scarf, gloves and a warm coat.